Our Makita tool reviews feature job site testing that uses real-world conditions. We test tools like the Makita X2 rear handle circular saw on both dimensional lumber and sheet goods. 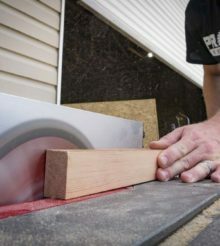 For products like the Makita 10″ cordless miter saw, we use 2×12 lumber to test the depth of cut and power. In terms of technology, the Makita AWS Auto-start Wireless System is among the most advanced Bluetooth control systems out there. It’s compatible with the newest Makita Track Saw, the Makita 18V X2 Brushless Angle Grinder, and their cordless vacuum. The system solves the problem of using cordless Makita tools with a cordless dust extractor. Also of note is the Makita Sync Lock system to program batteries and keep them from leaving the job site. The following Makita tool reviews use either in-house scientific baseline testing or we take them on-site. They might be used on a live construction site or in the PTR Shop.